Instead of having each bullet point appear separately upon clicking, you can make all the bullet points appear together when the slide comes on. You will need to turn off the animation of the bulleted list. This process also works in PowerPoint 2013 & 2010. 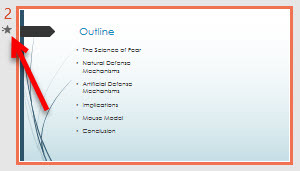 Step 1:Display the slide you wish to change.Step 2:Look at the Slide/Outline Pane on the left. The star under the slide number indicates that animation is applied. You will need to turn this animation off. Step 3:Click in the bulleted list to select the text box. Step 4:Click on the Animations tab. Choose None from the list of animations. 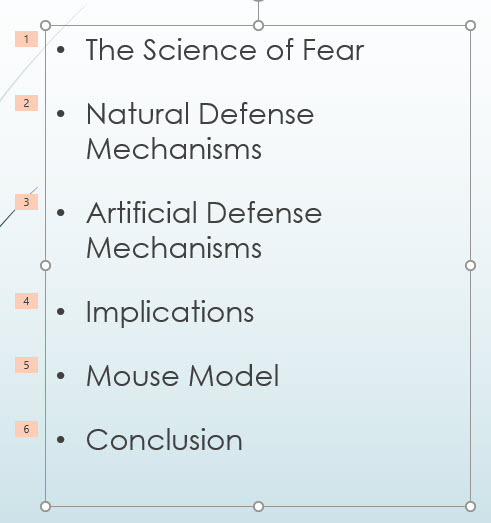 Step 5:The bulleted points will now appear all together during your presentation.